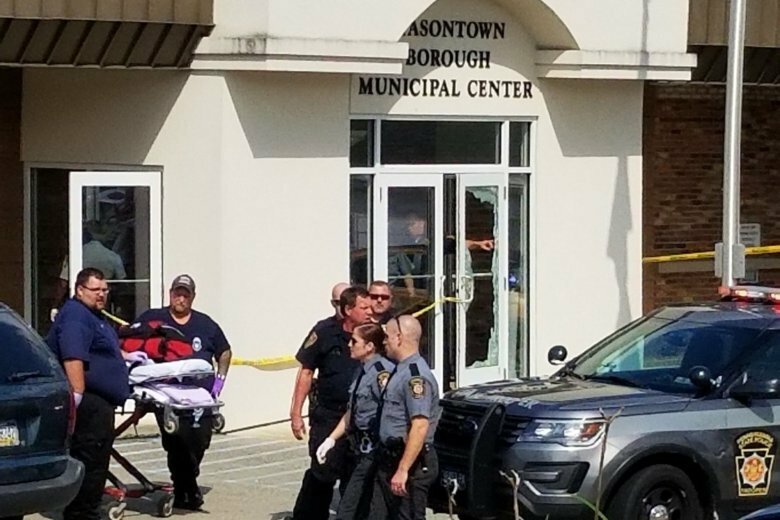 MASONTOWN, Pa. (AP) — The wife of a gunman killed after he opened fire at a Pennsylvania municipal building Wednesday said in a social media post that she was OK but did not say whether she had been injured in the shooting. Dowdell was shot and killed by a German Township police officer, who has not been identified. Dowdell had been arrested Aug. 25 and charged with aggravated assault, terroristic threats, strangulation, simple assault and harassment. The Observer-Reporter obtained court records related to a protective order granted against Dowdell and obtained by his wife Crystal. Crystal Dowdell said in her August 27 request for a protective order that her husband had grabbed her and threatened her with a gun three days earlier after she asked for a divorce. She reported to police that he also choked her with a belt two days earlier, after accusing her of blocking his phone number and ignoring his calls. “He said if this is the way I want it this is the way it will be. He said there would be no divorce and he would take out whoever he needed to take out,” she wrote in the petition. The final protection order granted on September 10, ordered authorities to get his belongings, and car from the shared home and to confiscate any of Patrick Dowdell’s firearms or weapons. It was unclear Thursday if the order had been executed.